​​Client is a 58-year-old single male who previously was employed by the Volusia County School System. The home is a two-bedroom two bath home. The client is currently receiving and surviving on disability. Three years ago, the client attended to an emergency medical condition. The client states his main recovery time took two years and while he was recovering Hurricane Matthew occurred. The client states he has many medical appointments however is doing well at this time. The client states that he hopes that the repairs can be made to his home in order to make it safe for his elderly mother to be able to stay with him from time to time. 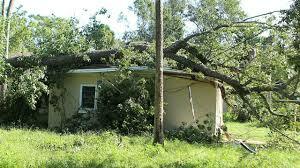 The hurricane caused major roof damage along with interior damage. The client had no insurance on the home for he could not afford the insurance premiums. The client did not qualify for assistance by the City of Daytona Beach for he had no insurance. After two appeals, FEMA provided some money to the client which he used in mucking out the home, tree and debris removal, roof patching and securing the rear door to the home for it blew off during the hurricane. Client is a 72-year-old single male who is also a Veteran. The home is a two-bedroom one bath home. The client’s parents had owned the home since 1966. The client had moved back into the home in 1991 to care for both his father and mother. The clients father passed in 2002, mother died of Alzheimer’s in 2005 and the clients only sibling died in 2016. The client remains grieving over the loss of his family. Hurricane Mathew caused a tree to fall on the clients home causing electrical and roof damage along with further roof and window damage. The interior of the clients’ home to include ceilings and walls are also water damaged for the roof has remained leaking. The clients’ insurance was cancelled in 2006 for the client could not afford the insurance premiums and his mother’s care. The client received some money from FEMA that was used to remove the tree and debris, electrical repair and roof patching. ​Client is a 59-year-old widowed mother of two. The clients’ son resides in the home with the mother and is attending college. The clients’ son is experiencing health and well-being issues because of the death of his father in March of 2016. The clients’ daughter resides out of the home and is attending college. The mother was employed part time with SDS Education and is currently looking for full time employment. The mother has been using her credit cards to provide for her and her family. She had to pay out of pocket for her husband’s funeral for there were no death benefits. The home is a 3-bedroom, 2 bath, 2 story home. Damages caused by Hurricane Matthew include roof replacement and major interior ceiling and wall repairs for the roof is a steep pitch and cannot be safely tarped. The mother has been trying to add roofing tar where she can in order to keep the roof from leaking into her and her sons bedroom. Water is also leaking into the kitchen/dining area. The mother could not afford to keep the insurance on the home. FEMA denied any funding stating that the damage from the hurricane did not make the home unsafe to live in. I wanted to make sure that everyone involved with this organization understands how overjoyed with gratitude I am because of all that was done for me. My very first encounter with Terry Foley was an emotional one because things have been rough for some time. Terry allowed me an opportunity to explain my situation through tears. At one point I thought she was going to join me, but then she made me laugh. Having several issues to resolve before the roofer could even start left me bewildered. However, once resolved, I spoke with Tim Williams who took over from Terry with much compassion, understanding and empathy. He is such a go getter and was determined to see this job completed. I cannot tell you how appreciative I am to have had someone who genuinely cares for his customers. We emailed, called and met in person and he was always positive, upbeat and comforting. To tell you the truth he made me feel like family. He reminded me over and over that everything would be alright and after his constant interaction I had no doubt that VIND was working hard on my behalf. I am not sure if anyone working for VIND understands that I had NO options until I received (what I thought initially was a scam) a call asking about my problems I may have had because of the hurricane. This one phone call has made a tremendous impact on my life and I am forever indebted. Tim Williams...you rock!